Dr Seizo Katsunuma (1886–1963), Founder of the Japan Society for Cellular Chemistry. Image: Cell Struct. Func. 26: 1–8 (2001). The JSCB aims to contribute to the advancement of cell biology both nationally and internationally. Its activities include supporting Japanese researchers; publishing research results through its official journal, Cell Structure and Function; sharing experimental protocols; and organizing JSCB and international conferences. 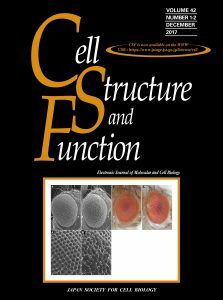 Cell Structure and Function launched in 1975 as an English-language journal, replacing the annual symposia of the Society that were published in Japanese. The journal is now published twice a year and is freely available online via J-STAGE. Successive editorial boards have worked hard to improve the quality of Cell Structure and Function and to ensure that it remains abreast of current trends in scholarly publishing. The JSCB holds its annual conference each spring, which attracts up to 800 delegates and includes up to 400 oral and poster presentations. The Society has also hosted key international meetings, such as the Third International Congress on Cell Biology in 1984 and the Third Asian-Pacific Organization for Cell Biology Congress in 1998, and has co-organized other important international meetings both within and outside Japan. The JSCB is keen to support early-career scientists in particular, as they represent the future of cell biology research. A recent addition to the annual JSCB conference is the Young Investigator Award. Shortlisted applicants make oral presentations, which are scored to determine the award winners. Dr. Shigeyasu Amano (1903–1964) (left) and Dr. Satimaru Seno (born 1915). Image: Cell Struct. Func. 26: 1–8 (2001). Several distinguished JSCB members have been honoured with prestigious awards such as the Albert Lasker Basic Medical Research Award, the Canada Gairdner International Award, the International Prize for Biology, the Lewis S. Rosenstiel Award for Distinguished Work in Basic Medical Research, the Wiley Prize in Biomedical Sciences and the Kyoto Prize. Since its inauguration, the JSCB has made great efforts to adapt to rapid advances in cell biology. Through its varied activities, it continues to position itself as a leader in the life sciences in Japan. A history of the journal was published in 2001 by Yutaka Tashiro and Tohru Okigaki (“A brief history of the Japan Society for Cell Biology”, Cell Struct. Func. 26: 1–8).